My boys have spend most of their time in their favorite corner of their room building LEGO creations. I’ve heard the sounds of them searching for the perfect LEGO brick to complete the next step in their current project. To make things easier, we’ve set up their LEGO building corner in a way to make searching for bricks a breeze. 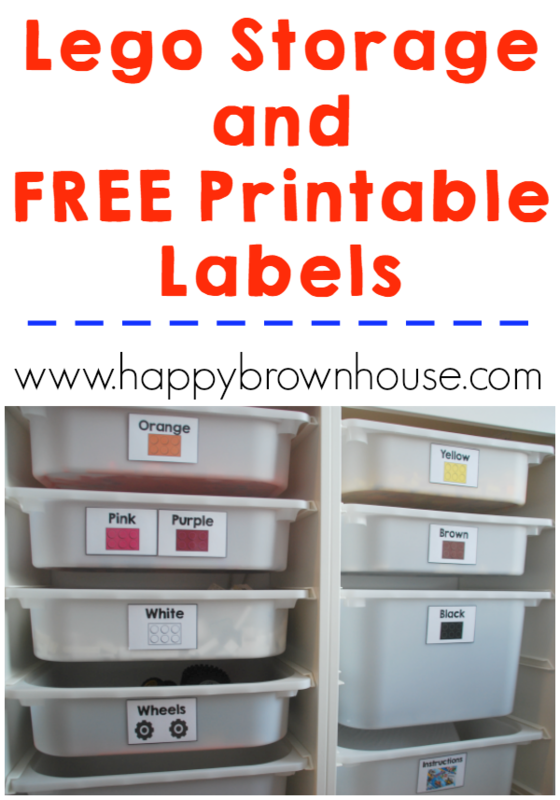 To do this, I used some Printable Lego Storage Labels I made and some furniture from Ikea. 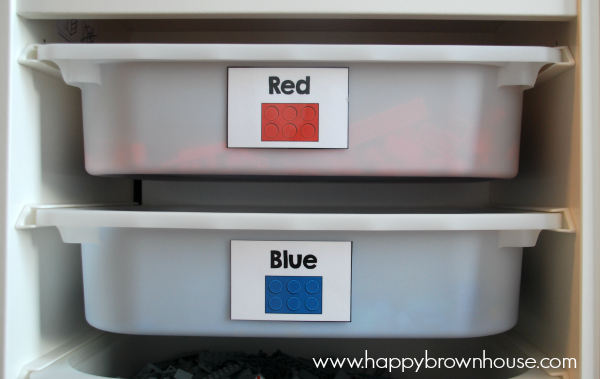 For our LEGO storage, we chose to use the IKEA TROFAST storage system and sort the LEGO bricks by color. After sorting the bricks by color, I made labels for all of the storage bins to help the boys be able to quickly find what they need. Each color is sorted and then we’ve got a bin for mini-figures, wheels, and LEGO instruction manuals. 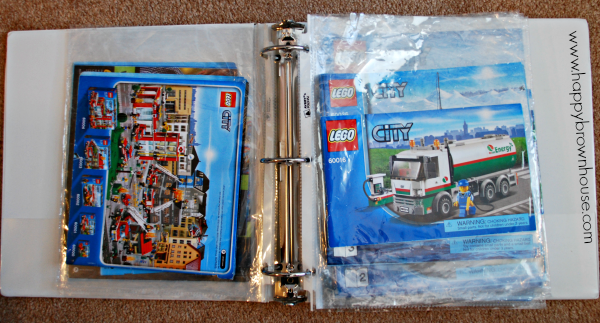 The instruction manuals are placed in page protectors in large three ring binders. 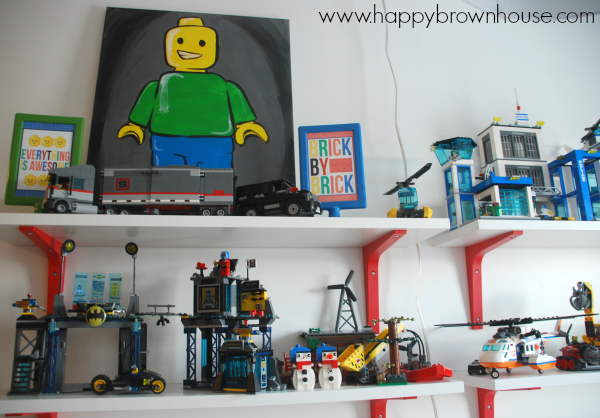 Above the storage, we’ve hung shelves to hold all of the creations made with LEGO bricks and the painting of the mini-figure that my oldest and I made at a local painting class. They’ve filled them up quickly and we already need more! 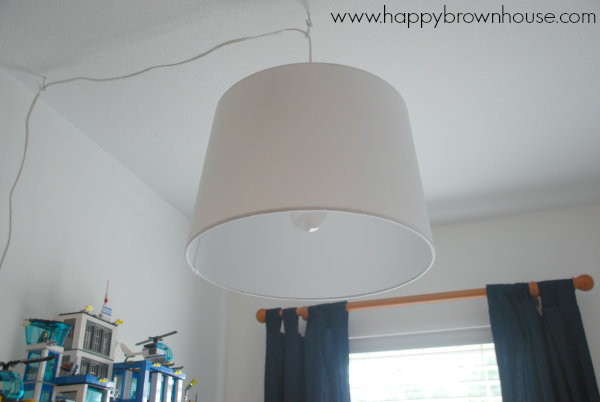 I also hung a pendant light from the ceiling made from the pendant light kit and a drum lamp shade to light up the space for night building. One way that I’m making good use of their building time is by incorporating some ideas found in The Unofficial Guide to Learning with Lego® written by some of my blogger friends. 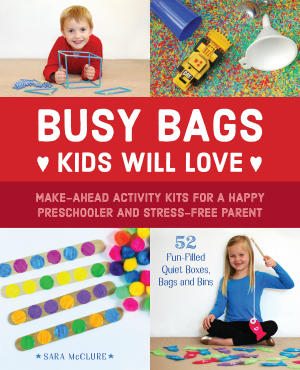 This book is jam-packed with creative ideas to enhance building time and learning. Some of my favorite ideas in The Unofficial Guide to Learning with LEGO® are the Duplo Pendulum Painting and the LEGO Reading Aids. They are pure genius. If you want to harness the power of LEGO learning with your little LEGO lover, you should totally grab this book. It’s available in Print, Kindle, and eBook formats. I’m also sharing my LEGO labels for my bins with you in case you want to organize your LEGO bricks similar to ours.